Yesterday’s Apple keynote was one of the company’s best in quite some time.1 One reason why was, as John Gruber noted, a certain sense of stagecraft, editing, and overall flow that has at times been missing in recent keynotes; I think a bigger reason, though, was the simple fact that Apple launched a whole bunch of new hardware products — the new iPad Pro, the new Apple TV, and, of course, updated iPhones — and new hardware makes for compelling keynotes. If the last decade-and-a-half has taught us anything, it is that Apple is really, really good at making hardware products, for a whole bunch of reasons. As CEO Tim Cook and his fellow presenters repeat at every opportunity, the fact the company controls both the hardware and software layers is critical; less remarked upon but just as important is the way in which Apple’s massive cash position enables the company to spare no expense when it comes to designing, producing, and scaling new products. Similarly, Apple’s scale gives them unmatched leverage in the global supply chain, ensuring Apple always has the best components made in the best factories for the best prices. It’s a lot easier to give the designers control when Apple’s business model is predicated on achieving high margin, not necessarily the lowest possible cost. 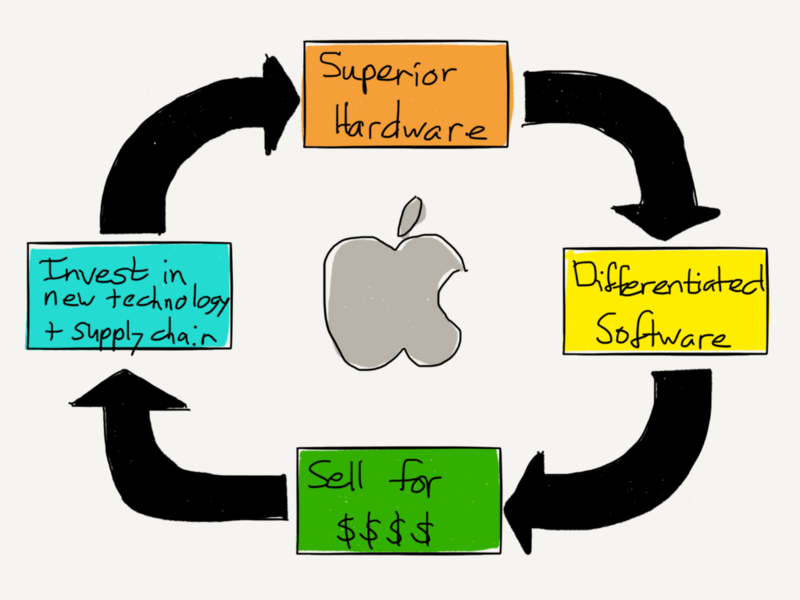 Relatedly, all of the company’s software development, from operating systems to cloud services, exists to differentiate the hardware, not to make money in their own right,2 resulting in a virtuous cycle that means it is becoming more difficult to compete with Apple’s hardware products over time. That bit about one’s phone being one’s most important and most used possession is critical: Apple’s cycle of accelerating improvement only matters to the extent that iPhone customers perceive benefit from those improvements. It is easier, though, to perceive and value those benefits the more you use a device, and the more uses a device has; to put it another way, an infinite number of interactions with a slight improvement is even more valuable than a few interactions with a huge improvement. By extension, the mistake made by Apple bears who continually claim the iPhone is “good enough” is to underestimate just how much people use and value their phones. The “good enough” critique, though, certainly applies to the iPad; while a smartphone and all of the social and communications apps that run on it are a necessity for nearly everyone, for many the iPad simply doesn’t have that many use cases beyond, perhaps, video, an activity that worked just fine on the original iPad. And so, most iPad owners have declined to upgrade, and just as many if not more iPhone owners haven’t even bothered to buy an iPad at all; as a result, sales have plummeted for several years now. “Next up is iPad. iPad is the clearest expression of our vision of the future of personal computing. A simple multi-touch piece of glass that instantly transforms into virtually anything that you want it to be. In just five years the iPad has transformed the way we create, the way we learn, and the way we work. We’re partnering with the world’s leading enterprise companies, IBM and Cisco, to redefine and transform the way people work in the enterprise. As we’ve brought more and more capability and more and more power to the iPad we’ve been amazed at the new and unexpected things that our customers have done with the iPad. So we asked ourselves, how could we take iPad even further? Today, we have the biggest news in iPad since the iPad. And I am thrilled to show it to you. Note that phrase: “How could we take the iPad even further?” Cook’s assumption is that the iPad problem is Apple’s problem, and given that Apple is a company that makes hardware products, Cook’s solution is, well, a new product. My contention, though, is that when it comes to the iPad Apple’s product development hammer is not enough. Cook described the iPad as “A simple multi-touch piece of glass that instantly transforms into virtually anything that you want it to be”; the transformation of glass is what happens when you open an app. One moment your iPad is a music studio, the next a canvas, the next a spreadsheet, the next a game. The vast majority of these apps, though, are made by 3rd-party developers, which means, by extension, 3rd-party developers are even more important to the success of the iPad than Apple is: Apple provides the glass, developers provide the experience. That simply isn’t the case on iOS. Note carefully the apps that succeed on the iPhone in particular: either the apps are ad-supported (including the social networks that dominate usage) or they are a specific type of game that utilizes in-app purchasing to sell consumables to a relatively small number of digital whales. Neither type of app is appreciably better on an iPad than on an iPhone; given the former’s inferior portability they are in fact worse. A very small number of apps are better on the iPad though: Paper, the app used to create the illustrations on this blog, is a brilliantly conceived digital whiteboard that unfortunately makes no money; its maker, FiftyThree, derives the majority of its income from selling a physical stylus called the Pencil (now eclipsed in both name and function by Apple’s new stylus).4 Apple’s apps like Garageband and iMovie are spectacular, but neither has the burden of making money. These mechanisms work: they are the core of the Mac application ecosystem which has been thriving with a far smaller user base for years now.5 Absent their implementation it is simply foolhardy to invest the sort of time and resources necessary to transform the iPad’s glass into the experiences that make it worth owning, and by extension, overly optimistic to think that a form factor change will bend the iPad growth curve up and to the right. These images are from MacWorld Boston in 1997, where Steve Jobs announced that Microsoft was investing money in the nearly bankrupt Apple and, more importantly, committing to a Mac version of Office. The reality for Jobs and Apple was that the company’s users needed Office (along with Adobe’s products) more than they needed a Mac. I’ve long argued that being in this position is a big reason why Apple hasn’t enabled sustainable apps: never again would a software developer hold Apple hostage. The irony, though, is that when it came time to launch the iPad Pro, Apple had no one else to turn to. Over the last several years both Microsoft and Adobe have altered their business models away from packaged software towards subscription pricing; while their users may have grumbled, they also had no choice given their dependence on the two software giants’ products. And, it’s that new model that justifies the expense of developing iPad apps and explains why it is Apple’s old nemeses who are doing by far the most interesting work on the iPad.7 Unfortunately, this isn’t a model that is readily replicable for the sort of development shops that Apple needs to invest significant time and resources in creating must-have iPad apps: what customer is going to sign up for a recurring payment for an app that doesn’t even have a service component and that the customer hasn’t even tried? What’s fascinating to consider is that it’s arguable the iPad would actually be in a much better position were it owned by Microsoft: the company is at its core a platform company that has long bent over backwards to accommodate its developers even at the expense of the user experience. That, though, is the rub: in consumer markets the only way to gain the prerequisite scale to be a platform is to first have a superior product, like Apple. More than ever each has what the other needs. Long-time readers know this isn’t the first time I’ve written about Apple’s inability to foster a healthy app ecosystem (again, beyond front-ends for ad-supported services, free-to-play games, or the most simple of apps) and how I believe that inability has held the iPad back. The concern, though, is that it is very possible to envision the Apple TV going down the iPad route. Apple’s declaration that “The Future of TV is Apps” is a very compelling one, but the degree to which that vision is realized is inextricably tied to the prospects developers have for making money. Ultimately, for Apple, as diligently as the company may have worked on the iPad Pro and Apple TV, the truly difficult part begins now: the company remains far ahead of nearly anyone else in the world at creating great products, in part by zealously controlling everything from core technology to the supply chain to the retail experience. Platforms, though, while established through product leadership, flourish and sustain themselves by empowering and entrusting developers to build something so compelling that customers fall in love with not just the hardware but the experience that runs on top of it. In short, they require sharing the customer relationship, and while that may go against Apple’s instincts, to not do so is increasingly against Apple’s interests.